"A new addition to our holiday menu. 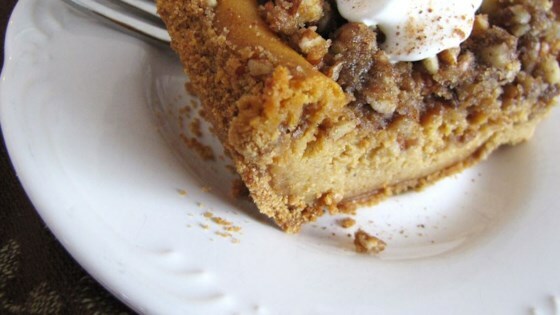 Combines pumpkin, pecans, and cheesecake. Originally submitted to ThanksgivingRecipe.com." Combine pecans and 1/4 cup brown sugar; cut in butter or margarine with a pastry blender until mixture is crumbly. Set aside. Beat cream cheese at high speed of an electric mixer until smooth. Add 1/3 cup brown sugar; beat well. Add eggs one at a time, beating well after each addition. Stir in pumpkin butter. Pour mixture into crust. Bake at 350 degrees F (175 degrees C) for 40 minutes. Sprinkle pecan mixture over pie. Bake for 5 additional minutes, or until butter or margarine and sugar melt. Cool on a wire rack. Cover, and chill for at least 4 hours. Thank goodness for pumpkin cheesecake! This Pumpkin Butter is an excellent hostess present, and is a wonderful spread for toast and muffins. It can also be used to make a spectacular holiday dessert, Pumpkin Pecan Cheesecake. I think something must have been left out of this recipe because it never rose ...it came out of the oven and it was still about an inch high....very disappointing. Yum!! Tastes almost like the pumpkin pecan cheesecake at the Cheesecake Factory!! I don't like pumpkin pie....but this pumpkin cheesecake is fantastic! Rich and spicy, and wonderful with a whipped cream topping!